Double Glazing U Values Explained. Double glazing U values are also called heat transfer coefficients. They are used to measure the effectiveness of various elements in buildings as insulators. This means, U values determine the effectiveness of certain elements at preventing heat from easily transmitting between the outside and the inside of a building. The reciprocal of U values are R values. They measure the thermal resistance of a building. 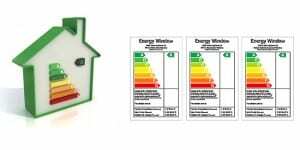 If the double glazing U values are lower, it means the building fabrics transmit heat every slowly. Therefore, the buildings perform better as insulators. With much lower U values, the building requires less energy to maintain comfortable conditions. This leads to lower energy bills. Thus, homeowners are able to save some money. How much money you can save? In order to find an accurate answer to this question, you need to seek professional help. Since energy prices have been increasing rapidly, there has been greater awareness among homeowners regarding sustainability. Double Glazing U Values Explained. Due to this, performance measures like U values are considered more important. Companies like The Advanced Group try hard to achieve lower U values. In most cases, it requires certain changes in the building design, both in the make up of certain building elements, such as double glazing and cavity walls, and the use of materials, such as insulation. In fact, it also requires changes in the overall structure of the building’s fabric, such as reducing the standard proportion of glazing. Double Glazing U Values Explained. In most regions, building regulations prevent some forms of buildings by setting specific limiting standards for maximum U values. It’s important to differentiate between U values for assemblies, materials and other elements. The U value of any element can be easily calculated with the sum of all the thermal resistances, i.e, R values, of the layers making up the element and its outside and inside surface thermal resistance, i.e., Ro and Ri. In this equation, the thermal resistance of individual layers of R element is equal to the thickness of each layer divided by the thermal conductivity of each layer. Double Glazing U Values Explained. If you are an amateur, it can become a very complicated calculation. Moreover, if you are working with too many layers or the element is inclined and the layers have unventilated or ventilated cavities, it can be even more complicated. Most manufacturers provide you with U values for all the products they supply. In addition to this, you can choose from a wide range of U value calculators. These are easily available on the Internet. If you are still confused, you can ask for a free survey from The Advanced Group. The company will clear all your doubts. Double Glazing U Values Explained. Give us a call at The Advanced Group today on FREEPHONE 0500 338 488 to find out more and to get a FREE consultation with a helpful member of our team. Or Simply complete the enquiry form on this page.